Summer is over & it’s time to start thinking about school! I received some toys from VTech and LeapFrog to check out for my new granddaughter. My boys are all back in school. The youngest two are now in 5th and 6th grade and the older two are in college. So now it is time to shift the focus from all day fun to learning along with fun. I believe that kids learn best when there is some fun involved. My children have always been good students as I developed the love for learning at an early age. When my kids were young they enjoyed using interactive learning toys when they were not in school. These toys along with mom interaction helped my children learn things like ABCs, Math, reading, and so much more. Then when they started school the interactive toys helped them increase the things that their teacher taught them. The fun toys that played music and had bright lights along with buttons to press were also great for long car trips. My boys had fun and learned at the same time. Now that my boys are older, they prefer learning games on the computer instead of the handheld interactive learning toys. My daughter just had a baby so as a first-time grandma, I am now looking at some fun learning toys that VTech and LeapFrog have that introduce important skills. My grandbaby is still too young for these type of toys as all those flashing lights and sounds are too stimulating for her growing brain. I believe that these types of toys are great ages 2 and up. I also believe that electronic toys should not replace interaction between a parent and a child. Parents should still read and sing to their children. I am one that uses the trip to the store with my child as quality time and I will use this opportunity for learning by having my kids help me look for items in the store. It cringes me when I see young kids in a shopping cart watching a movie on a device and a parent talking on the phone. I once even saw a young child watching a movie on a phone while walking behind their parents in a store. We parents need to slow down and spend time with our kids even if it means talking to them while at the grocery store. Notice that I said these toys can enhance one on one learning that kids get from parents or teachers and should not be a substitute for learning. These type of toys can help the parent teach their child as the sounds and bright lights stimulate senses and encourage fine learning. They can also help build important skills. My boys would play with these toys and I would have fun with them. I just loved singing the ABCs with my boys. I love the learning toys that have a digital writing pen as it saves paper as they are learning to write. Check out my favorites for my new grandbaby! I like this cute turtle as it can be enjoyed without the electronic part, making it a perfect toy for younger kids. My grandbaby can get some great fine motor skills and sensory play as she touches the different textures on the turtle. 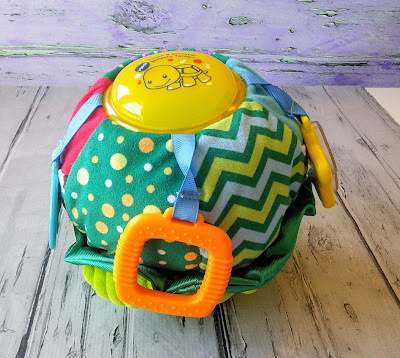 I love that this cute colorful turtle is also soft so little ones will not be hurt when they drop it. The turtle also has a mirror as babies love looking at themselves. When my granddaughter gets older, her mom can turn the turtle on so the baby can press the buttons to learn her colors. This cute plush will be great for long car ride entertainment. When the Touch & Discover Sensory Turtle™ comes out of his shell, he's sure to entertain your little one! 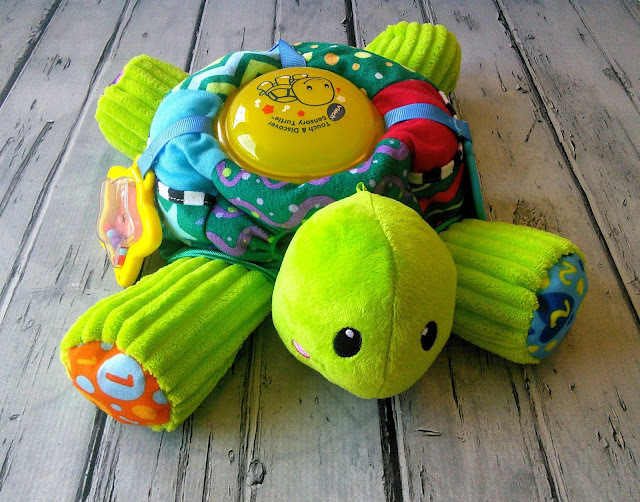 This cuddly plush turtle features a variety of textures, colors, and patterns to stimulate your baby's senses and encourage fine motor skills. Play peek-a-boo with the cute and cuddly turtle by tucking in his head and legs to change him into a soft, wobbly ball for 2-in-1 play. The chunky button on the top of the shell is easy for little ones to press and lights up in a variety of colors as it responds with sounds, music, and cute phrases. The shell includes a baby-safe mirror, rattle, and ring. There's plenty to see, touch and explore with this textured tortoise! When my daughter starts teaching the baby her ABCs, this Backpack will help my granddaughter recognize the letters and help her to write the letters. I like that everything stores inside the case so nothing gets lost. I can see little ones having fun carrying the interactive toy on their back and pretending to go to school. The toy will help my daughter to help the baby associate the letters with sounds and words as they place the letters into the spaces. I remember the fun that my boys use to have pressing buttons on their ABC toy and the repeating the letter and the word that the toy would say. This would be a perfect toy to take along for doctor appointments to help pass the time while waiting for the doctor in the boring examination room. I never understood why all the fun toys were in the waiting room and there was never anything to play with once we got back to the exam room, except for a couple books that we read through quickly. This mom could only do so much singing or I Spy while waiting forever for the doctor. Embark on a learning adventure with Mr. Pencil and the Go-with-Me ABC Backpack™. This one of a kind toy lets toddlers interact with the alphabet in awesome ways. 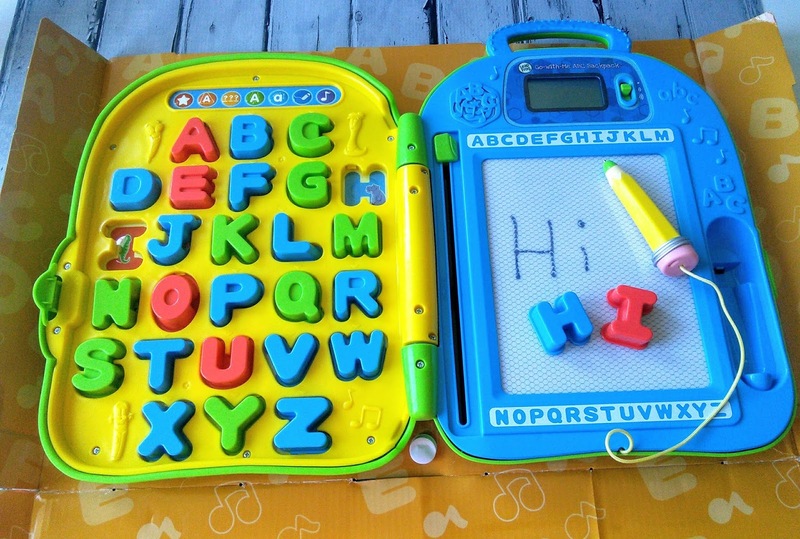 Using the write and erase board, kids can practice letter writing and draw with Mr. Pencil. The screen shows how to write each letter step-by-step and then shows how to turn each letter into animals. Inserting the 26 letter pieces into the letter spaces teaches the letter name, letter sound, an animal that begins with that letter and more. Little learners can play seven different activities and when they’re done, the plastic backpack holds all the pieces inside. Clip the backpack closed and wear like a real backpack for learning on the go. Draw, learn and get going! This cute puppy will be great for long car trips and helping my grandbaby fall asleep. I always read a story to my boys at bedtime but there were some nights that they had trouble falling asleep after the story and they wanted to stay up all night. So I would turn on some music or play a book on a tape to help them fall asleep. This cute puppy is soft so it can stay in bed with them and maybe when the baby wakes up she will play with the toy for a bit so mom can get that much-needed sleep. This toy can encourage a love for reading in young kids while helping them learn numbers, shapes, and other items. It is never to early to start reading to babies, my daughter who is also a teacher even brought a children's book to the hospital when the baby was born. I am not sure if she got a chance to read to the baby as the baby was having trouble learning to eat. My grandbaby is going to be smart as I know that my daughter will read to her plenty as my daughter read to her younger brothers. I remember the first time I brought one of the youngest boys, who was 18 months at the time, to the library and how he got so excited about seeing all the books. 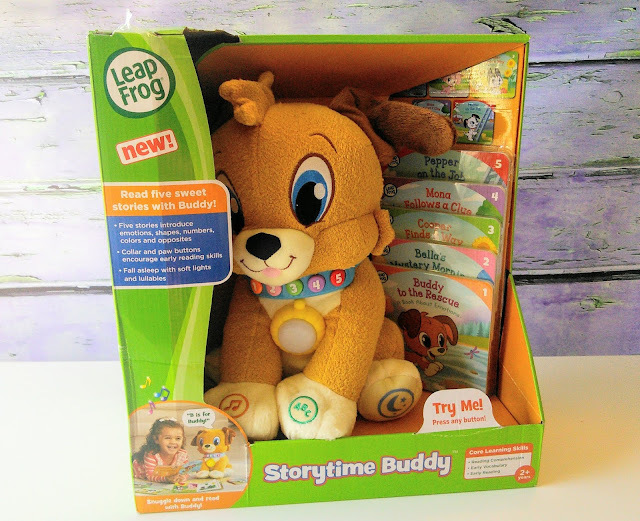 Encourage a love of reading with the plush Storytime Buddy™! Choose from five books about Buddy and his friends Bella, Cooper, Mona, and Pepper and Buddy will read each one. Beginner readers can read along while learning about emotions, shapes, numbers, colors, and opposites. Kids can also interact with Buddy by answering reading comprehension questions and singing along to happy learning songs. When it's time for bed, they can snuggle up and drift off to sleep as Buddy quietly reads bedtime stories or plays Brahms' Lullaby while his tag becomes a color-changing nightlight. 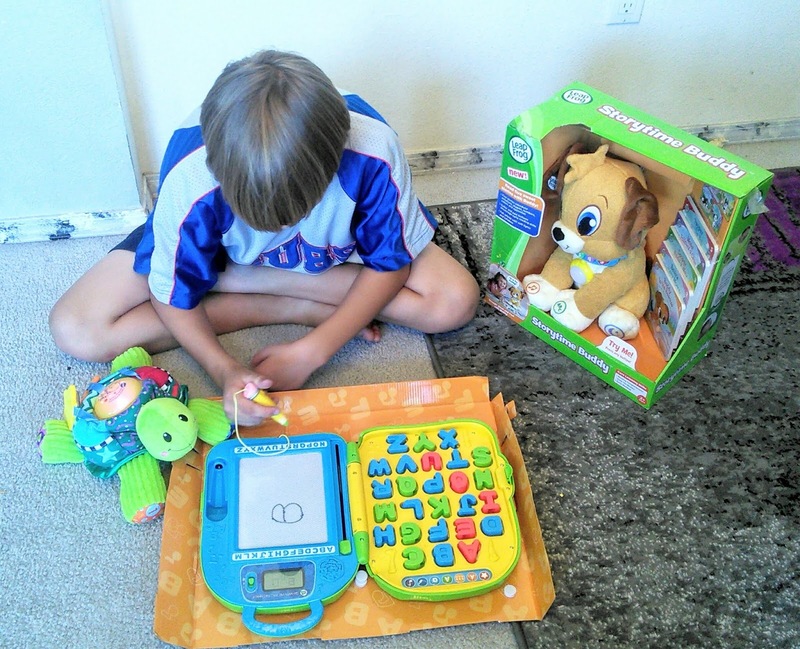 Which LeapFrog or VTech toy is your favorite? My kids also preferred learning games on the computer instead of the handheld interactive learning toys. Its also a better way to monitor what they are doing. These look like some great toys! We always had tons of Leapfrog toys when my kids were small. They did teach them a lot, which is important. Technology had made things so easy. These leapfrog toys look great. And it really helps them to learn. Vtech has always had some of the best learning toys for kids! I know I buy so many of their products for my little ones! Some of these look like they would make excellent Christmas gifts. 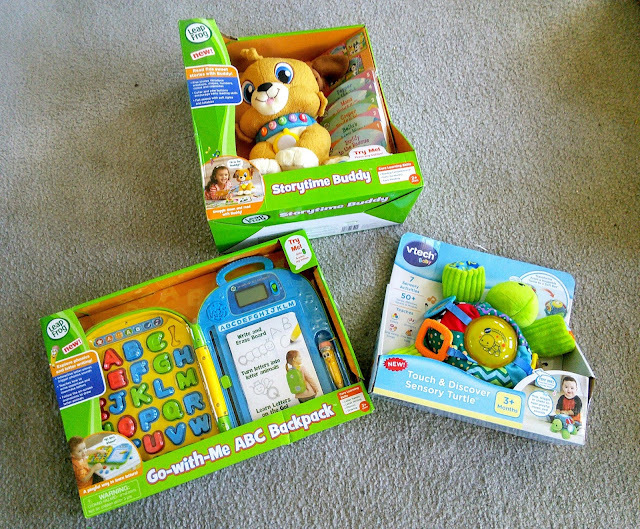 I really love VTech for my little ones. They help a lot when teaching them. V Tech has been my favorite for my son. I love leapfrog. My kids used them a lot when they were younger. I have to get a new one for my daughter. Thanks for sharing. I grew up with learning toys from Vtech. These would make a great gift for a little one for the Holidays or on a birthday. My son grew up playing with V-tech. It is one of my favorite toys to buys as gifts too! These look like great toys. I'll admit, I'm not really a fan of electronic toys for my boys, but when they are educational it makes it better. I always search for interactive toys to teach kids. Vtech is always my first choice. My kids love the magnetic letter doodle thing. We always have buy them in threes otherwise they fight over who gets to use them. I love learning toys for my kids. my daughters favorites have been her nabi jr tablet and her leapfrog toys. vetch is a great brand for toys geared more towards my younger child. im impressed with how far technology has come since I was a kid. I'm not a mom yet but I've always loved these educational toys for children. I've always said that I want to be a mom that uses these types of toys with her children. That turtle is so cute! My kids used lots of V-Tech toys when they were kids. I'm not sure if they still make the same ones, but they were great. I agree these toys are very educational! Not letting kids to use gadgets would be a wise idea. We simply adore the leapfrog and v-tech products, they are so innovative and colourful and great fun learning with the kids. I love Vtech products. They are always coming out with some amazing learning products for children and fun. Awe these learning toys are so cute!! Leap Frog has always made some awesome products that are also educational and fun!! My nephew has quite a few interactive Leap Frog toys. I think my favourite is his stationary bike he has to peddle to play a game. The game is him having to find certain letters. It's such a great idea! VTech definitely has been around for learning for a long time. I remember having things by them when I was 6 to help with spelling. They look really fun yet educational products. They would be perfect gift for my nephew. I loved Vtech learning toys when my boys were little. It was a great way to supplement their learning in the early grades.